“I’m not old enough to have shrubs!” a friend wailed at me one day while we were looking at her garden and she was trying to figure out how to make it more manageable. Well, small blooming trees may be the answer for those of us who are getting older. We might realize that a mixed border that includes small trees and shrubs will demand less work. The ornamental small blooming tree I have in my garden is a Sargent crab. It was a gift from a friend more than 15 years ago. Any cultivar name it might have had is gone and forgotten. I planted it in the center of our Sunken Garden, where three 5 foot stone walls are what remains of a large barn that was hit by lightning and burned down in 1990. My idea was that the tree would be the centerpiece of a garden with flower borders edging the stone walls. Those borders are also gone due to a changing water table that has made the Sunken Garden wet, even squishy at the south end, well into June. Now the Sunken Garden is mostly a rough lawn except for the Sargent crab which is about 12 feet high with an equal spread, a magnificent billow of blossom in May. The books will say that the Sargent crab needs a moist, well drained site in full sun. Mine has full sun, and the soil is more than moist all spring, and yet it thrives. The tiny red buds appear, then open into white flowers along each branch before the foliage appears. Tiny red fruits appear in late summer and last into the fall, much appreciated by the birds. A neighbor has an amazing witch hazel, Hamamelis ‘Arnold’s Promise, that produces its twirly golden blooms long before forsythia comes into bloom. I remember being mystified by how this sunny plant could be fragrantly blooming in a garden where nothing else was flowering. Since first becoming aware of witch hazels I have found other varieties, most of which will reach a height between 12 and 15 feet. Witch hazels prefer a moist well drained soil and they tolerate some shade but flower better if given full sun. Two other cultivars are ‘Diane’ which is considered the best red flowering form, and ‘Jelena’ which is very popular because it has coppery flowers, a spreading habit and good red-orange fall color. Another early spring bloomer is Cercis canadensis or redbud. When we took the train to New Orleans a couple of years ago in April we saw this understory tree blooming in a wonderful shade of dark pink in the woodlands we passed. It is listed as hardy to Zone 4, but I never saw it used very much in our part of the world until a few years ago. The deep pink, pea-like flowers bloom before the foliage appears and the effect is of a lovely airiness. As an understory tree it tolerates shade, but does fine in the sun, and prefers moist, well drained soil. Like witch hazels, this tree is a native and supports our local foodweb. 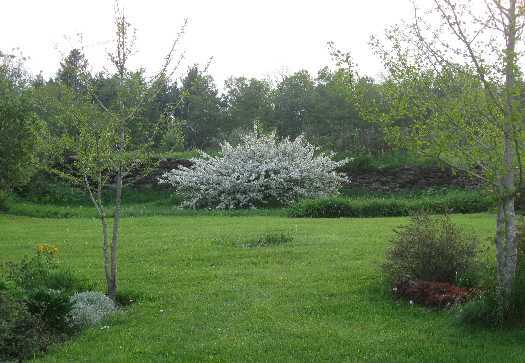 Chionanthus virginicus, Fringe tree, is another native tree with creamy white panicles of flowers that blooms in May. It will grow to ten or twelve feet with an equal spread. In the fall there are small fruits that attract the birds. Though fothergilla is a shrub that grows to a height of six to eight feet and has graceful spreading branches. I confused it with chionanthus for years. I don’t know why. The only thing they have is common is airy white flowers. Chionanthus has graceful panicles and fothergilla has smaller unusual blossoms that have been compared to bottle brushes. 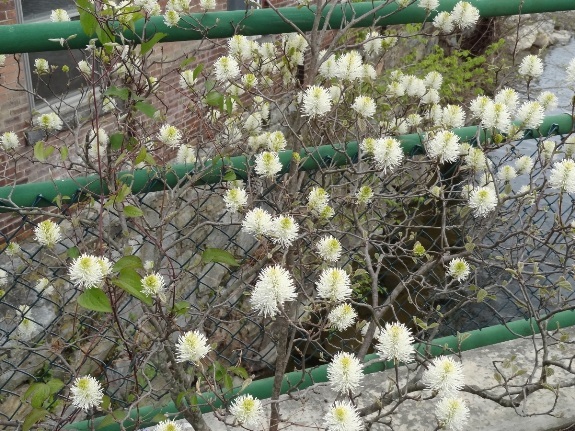 I can tell you that the fothergilla on the Bridge of Flowers always attracts a lot of attention because it is not well known, and people like learning about an easy to grow, interesting plant. The foliage is colorful and showy in the fall. I love our native dogwood, but Cornus florida has been a victim of the fungal disease anthracnose. It is no longer recommended for gardens. But when one door closes, another opens. Cornus kousa is an Asian dogwood, but it does not have serious disease or insect problems in our country. I would not really call it a small tree. It will reach a height of 25 feet with almost the same spread. It is magnificent in the garden but it is a specimen tree that needs room. The Kousa dogwood’s flowers are actually creamy bracts which make for a long period of bloom. 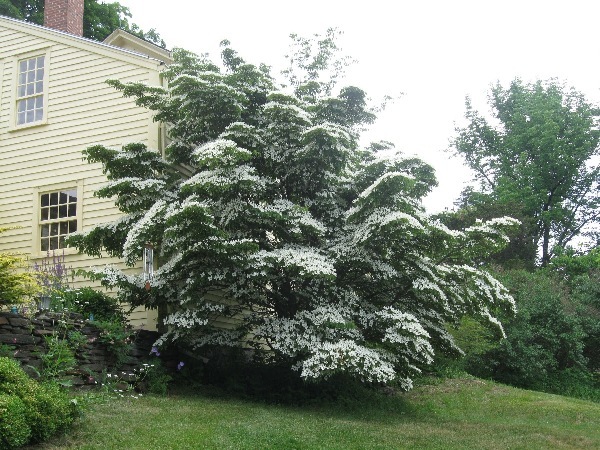 They look similar to those of our native dogwood, but the tree blooms in June when it is fully leafed out. It does attract bees and butterflies and produces fruit in the fall that appeals to the birds. Whether you are young or old(er), blooming trees can add a wonderful dimension to even a small garden. It can be the anchor to an early spring plantscape surrounded by early bulbs or perennials like brunnera or epimediums. Do you have blooming trees in your landscape? I love small flowering trees and the new varieties of Dogwoods are just unbelievable. Some with dark ruffled leaves, larger bi-colors and some almost shrub size! 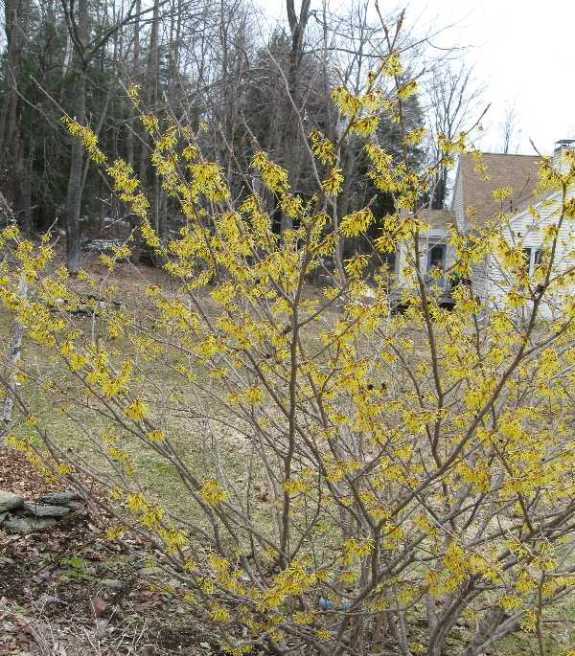 Great article, I always love to see the witch hazel in spring! I heartily agree with all of your recommendations except for the Kousa dogwood. If anthracnose is a problem in your area, then don’t plant the flowering dogwood. Otherwise, if planted in part shade with moist soil, it should do well. My problem is with the Kousa dogwood fruits, because they are not attractive to birds. I enjoyed your informative post. I have several of the plants you mention. When we moved here eight years ago, the first tree we planted was a Redbud. It did great for several years, then got so top heavy that a strong wind broke in right in half. I was so sad to lose my Redbud. Lee – I love that fothergilla too. I’m trying to figure out where I could fit one. Mary – I am going to have to look at some of those new dogwoods. You are way ahead of me. Jason – I didn’t realize that birds don’t like kousa fruits. Thanks for the info. Christy – It is always so sad when we lose a tree. But, of course, then, you can shop for a replacement.